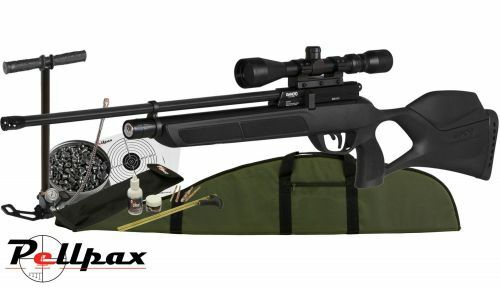 The all new GX-40 from Gamo is the latest PCP airgun from the world famous brand and combines their years of experience of airgun manufacture into one affordable package. The GX-40 is fitted with an air stripper to keep your shots even more accurate. The air stripper is removable and reveals a ½" UNF thread that will fit the majority of silencers. The gun has a thick rubber buttpad for comfort and the generous thumbhole stock has been shaped for lightness. This gun has a straight pull bolt and is ambidextrously shaped for easy use both left an right handed. Here at Pellpax we have put together a variety of kits to suit any need and budget from just the essentials to everything you could want! Add this item to your basket & spend an extra £207.01 to apply for finance.